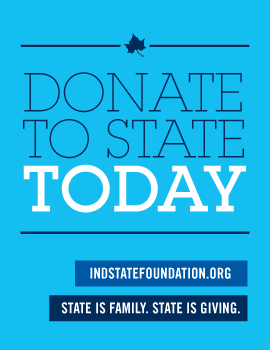 Indiana State University works collaboratively with third parties seeking to use ISU's campus for non-personal and non-media filming/photography (such as motion pictures, including documentaries, commercial video productions such as television shows, television commercials, commercial still photography and digital imaging). Indiana law provides ISU with the authority to regulate the use of its facilities. Non-personal and non-media filming/photography by third parties is subject to review by ISU to ensure that the request is compatible with the university's mission and purpose. Third parties not affiliated with ISU should contact Communications and Marketing to submit a specific request, generally a week in advance. Additional time may be needed for a large-scale project. The request should include the date, time, and location requested for filming, and a summary of the project, all of which will be reviewed through an internal review and approval process. To the extent applicable, the requestor should submit a location agreement as part of the request and allow for an appropriate time for review of the agreement by the Office of the General Counsel, Risk Management, and other University offices as necessary. The scope of the internal review will depend upon the specific request, but will generally include review of risk management issues, privacy or right of publicity concerns, perceived endorsement of products/services, branding compliance, disruption to campus activities, and overall protections of students and others while filming or photographing the location. Additional information may be requested from the requestor by Communications and Marketing in order to make a decision about the request. Campus groups or departments are encouraged to contact Communications and Marketing for specific assistance to arrange filming or photographing on campus. Third parties should contact Lisa Moore in Communications and Marketing at lisa.moore@indstate.edu or (812) 237-3773 with any questions about submitting a request.